As I pulled out of my driveway, on my way to the radio station in the early AM, I saw a parade heading down my road. A line of wild turkeys moved along the shoulder, heading toward Poison Ivy Acres. Fortunately my husband spotted them moving through our gardens and past the house on their way down to the lake, and caught them on camera. These birds move through periodically, and we treasure the turkey sightings as much as the bluebirds and occasional pheasant. All of the wildlife around us, including those *%$#@* squirrels, remind us of our connections to the land. Later this afternoon we took a walk through neighboring woodland and saw something interesting on a south-facing slope. Small sections of the normal forest floor, the layer of oak leaves and pine needles, had been cleared away and the loosened earth exposed. We surmised that in this area the sun had warmed the soil and allowed worms, grubs or other food to become available. Who was clearing these eighteen inch patches and feasting on what was available? 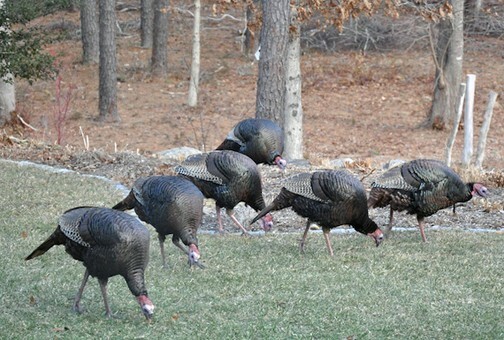 Our turkey parade? Skunks? Something else? Seeing something that we don’t understand, and thinking about what might be going on, is another joining of humans to nature. We are, thankfully, intellectually engaged by the natural world. The surrounding wildlife amuses, enriches and sustains us. 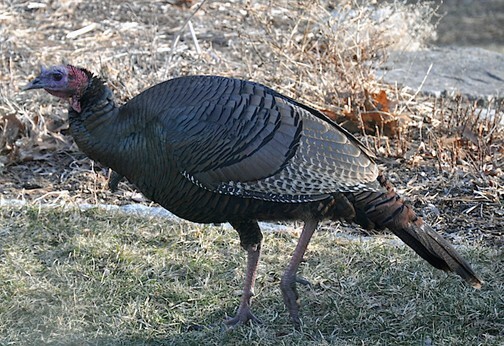 In a world where the humans are often the “turkeys on parade”, we should be humbled by our connections to the real thing. Half of the group moves across the lawn next to the deck and the perennial border. They are big birds, beautiful and comical at the same time.